The tastiest, most versatile vegetable side dish ever! If I were a poet, I suspect I would do nothing but write sonnets about fruits and vegetables. My love of produce is so deep that it actually invades my dreams….and this recipe is a case in point. A lovely backyard meal under the trees on a warm evening was the theme of my slumbering thoughts and when I awoke, I remembered just one dish from my dreamy menu: these fritters. A quick trip to the farmers’ market for corn, zucchini and green onions and my experimentation was under way. The light, crispy fritters were a snap to make. 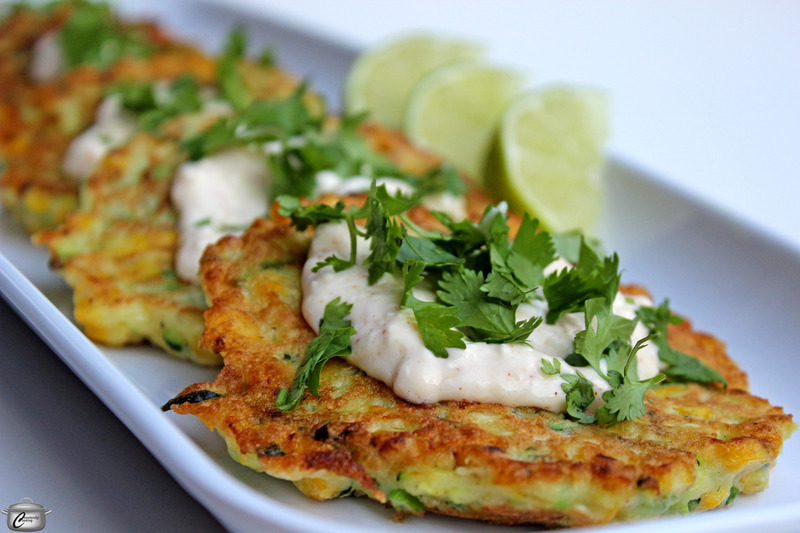 The topping is borrowed from this great Mexican-style grilled corn recipe and it was really fabulous on the fritters; they’d also be fantastic topped with your favourite salsa or chutney, for a little extra flavour pop. Last but not least, these fritters reheat beautifully so you can make them ahead for your next dream-worthy backyard party! I have served the fritters with grilled sausages and grilled fish and they were the perfect accompaniment for both. I also ate the leftovers with poached eggs on top for breakfast and that was pretty spectacular. Make topping by blending together mayonnaise, sour cream, feta, chili powder and lime juice. Cover and refrigerate. Preheat barbeque to medium-high. Peel husks and silk from corn and brush with a little of the olive oil. Grill, turning often, for about 15 minutes until kernels are tender and lightly charred. Remove from heat and set aside to cool for 5 minutes, then remove kernels from cobs with a sharp knife or corn stripper. Measure out 1 cup (250 mL) of corn and reserve the rest for another use. While corn is cooking, grate the zucchini on the large holes of a box grater. Measure out 1 1/2 cups (375 mL) and transfer to a medium bowl. Toss with 1/2 teaspoon (2.5 mL) coarse kosher salt and let sit for 10 minutes. Squeeze out as much moisture as possible with your hands, then transfer to a clean kitchen towel, wrap edges, and squeeze gently to remove more moisture. Dry the bowl and return zucchini to it. To the zucchini, add the grilled corn kernels, green onions, beaten egg, milk and a generous pinch of salt and pepper. Stir gently to combine. In a small bowl, combine the flour and baking powder. Add to the zucchini mixture and mix to blend well. Preheat oven to 325F if serving fritters right after frying in batches. Heat 1 tablespoon oil in a large, heavy skillet placed over medium-high heat. Drop a large dollop – I used a 1/3 cup (90 mL) measure – of the zucchini mixture into the skillet, then use the back of a spoon to gently spread out into a thin, round layer about 1/3 inch (1.2 cm) thick. Repeat with 2 – 3 more dollops (depending upon the size of your pan). Reduce heat to medium and cook until golden brown, 2 to 3 minutes per side; transfer cooked fritters to a rack placed over a baking sheet and let cool if serving later or keep warm in the preheated oven while remaining fritters cook. Add 1 tablespoon oil to the skillet and repeat with the remaining zucchini mixture. Fritters can be cooled then packed in an airtight container between sheets of parchment paper and refrigerated for up to 48 hours. To reheat, put on a wire rack placed over a baking tray and warm in a preheated 375F oven for 12 – 15 minutes. 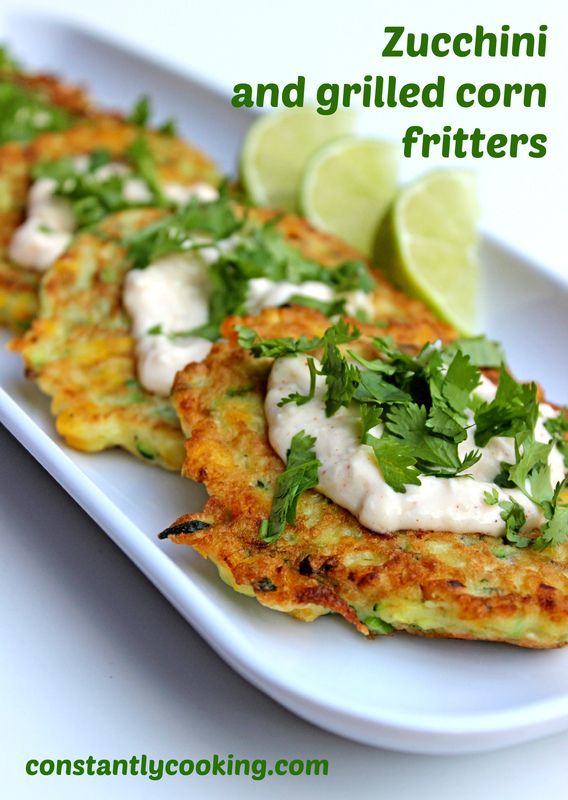 To serve, sprinkle the hot fritters with cilantro then serve with sauce and lime wedges. Makes 6 large fritters; recipe can easily be multiplied. This entry was posted in dinner, Vegetables, vegetarian and tagged backyard cookout, corn, fritter, fritters, fritters with sauce, gluten-free, Paula Roy, vegetable side dishes, what to make with corn, what to make with zucchini, what to serve with grilled fish, what to serve with grilled meat, zucchini. Bookmark the permalink.